It seems that the R-rated Christmas movie has become the new fad for the holiday season, with two similar films releasing in the month of December. The first of those films is Office Christmas Party, an attempt to inject holiday festivities with some R-rated twists that feel like a movie cobbled together from several disparate scripts. Office Christmas Party is the definition of a workshop movie – one that started out as one idea, and continued to morph as different writers tried to make it “work.” It’s never a good sign when a film’s story is credited to three people and the script is credit to three different people. It’s usually a bad sign, and in the case of Office Christmas Party it tells you all you need to know. The basics of the story, as the trailer will tell you, revolve around a company called Zenotek, whose Chicago-based branch is declining. Zenotek’s head in Chicago, Clay (T.J. Miller), is a happy-go-lucky, goofball boss who wants nothing more than to see his employees happy. However, his sister and Zenotek CEO Carol (Jennifer Aniston) would rather see the branch fold and watch her affable brother fail. 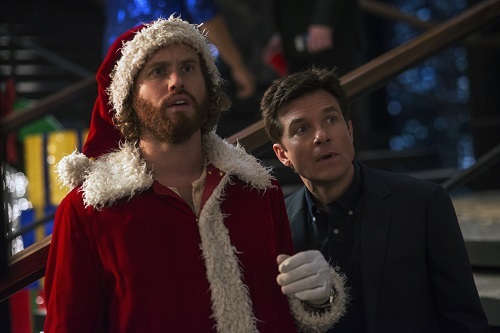 So Clay enlists the help of his CTO Josh (Jason Bateman) and a few others to put together an unforgettable Christmas party that should woo a potential client. However, what seems like the setup for a what-could-possibly-go-wrong comedy eventually spins into several variations on that core theme. The plot becomes more and more elaborate to the point it’s impossible to keep track of what type of story Office Christmas Party wants to tell. What at one point seemed fairly straightforward eventually becomes silly and confusing, and only moderately entertaining or funny. And to make matters worse, Office Christmas Party doesn’t try to put any stakes or consequences behind its absurd humor, making it all feel weightless. Each character in Office Christmas Party falls into one of two categories: either they are wildly absurd caricatures, like Kate McKinnon’s HR manager Mary, or carefully selected role fillers, like Olivia Munn’s love interest Tracey. Nobody feels in the slightest bit real in the film and everyone is there simply to do a job. The characters are drawn so broadly and vague that it’s impossible to connect with any of them, or to care when things start to spin out of control. The one thing that Office Christmas Party does have going for it is that the film is not devoid of laughs. There is some decent humor peppered throughout – enough to make you forget how poorly put together the film is or how generic all of the characters feel. Those laughs are not on par with a comedy that’s worth going to see in the theaters, but a casual rental might deliver a few smiles. But if you were to skip Office Christmas Party, no one would fault you. The film is a scattered mess that is clearly a hodgepodge of several different movies mashed together in the hopes of making something that’s interesting and funny. Unfortunately, while the film does have some laughs, it is so sloppy that it is hard to be invested, let alone entertained. Skip Office Christmas Party if you aren’t dying to see it. The hangover is not worth the trouble. Office Christmas Party has laughs, which for a film like this is a small victory. Its humor isn’t entirely new, and most of it is a little crass, but those R-rated laugh-seekers out there might come away a little satisfied. T.J. Miller makes a good doofus, and Jennifer Aniston is moderately enjoyable playing against type, but it’s really the random beats that keep Office Christmas Party going. Unfortunately, the random beats are just that, and therefore the film’s humor is never consistent and never sustained. You will laugh, but not as often as you would like and with the type of fervor befit an R-rated Christmas comedy.